Javacia issued this challenge last year too but I was just getting started with my blog. I launched on September 15th and I figured I had better get a few posts under my belt and figure this blogging thing out first! So I tucked this in the back of my head and decided that if the challenge was issued this year, I would definitely do it! I’ve learned quite a bit about myself through this process. I’ve learned that I CAN blog every single day! At first I thought I would run out things to write about but because I have been doing this consistently this month, ideas started popping up quite frequently. To say I was excited and pleased would be an understatement. Javacia said writing is like exercise and she is so right. It takes practice to get better and I was definitely seeing this. I also thought that people would get tired of seeing my posts. Once the post is published, I would add it to my personal Facebook page, the See Jane Write and Alabama bloggers Facebook pages, my twitter account and finally, to my Instagram feed. I started feeling like I was over saturating social media with my posts, but what I found out is that more people were finding me and commenting or “liking” my posts. My family was also enjoying my posts and this is very important to me since I am writing a lot about them and our family history. At first, I was a little worried that I would get some of the stories wrong or mixed up, but then I remembered – this is “my” voice and my recollection of things so once I internalized that, I would write the story. Finally…since I always include my photographs in each of my posts, I realized just how any photographs I take in a month! Yikes!!! And this doesn’t include the old family photos that I have yet to scan, my dad’s slides and the photos I took before digital. Of course, I have no intention of reducing the number of photos I take… I really can’t help myself. When I look at a scene, I’m always composing the picture in my mind when I don’t have a camera handy. But I also take plenty with my iPhone too! As I get ready to hit publish on this last post, I want to thank Javacia for the challenge and the encouragement. If you are a blogger and have never tried this, I encourage you to give it a shot. I’ve loved every minute of it! 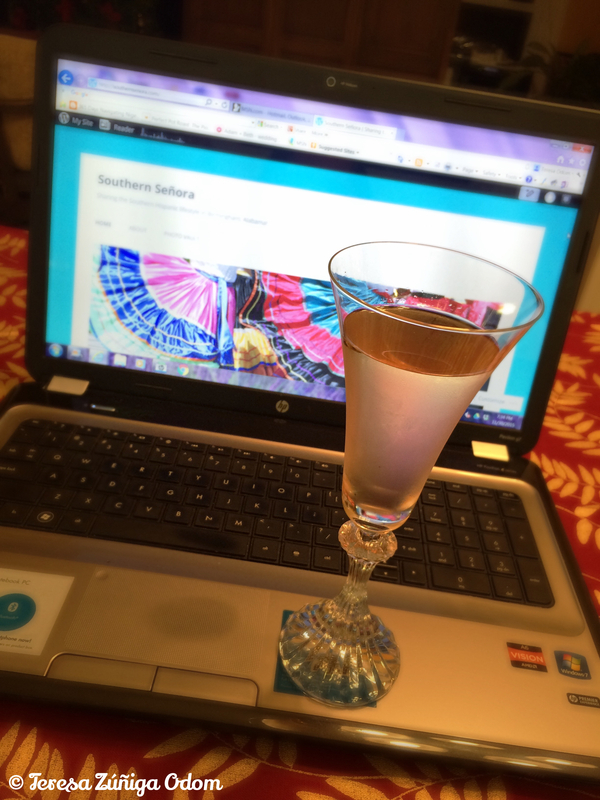 This entry was posted in Blogging, See Jane Write and tagged Alabama Bloggers, Bloglikecrazy, Challenge, Javacia Harris Bowser, Photographs, See Jane Write on November 30, 2015 by Southern Señora. So…what do YOU do with your turkey leftovers? In the past we’ve just divided everything up with the family and had turkey sandwiches or re-heated the entire meal for the next day at lunch or dinner. This year, our family gathering on Thanksgiving day was smaller and we had an awful lot of leftover food in the fridge! It’s hard to watch it go to waste on Saturday, especially when my son decided to go out to eat with friends and my youngest daughter was in Auburn for the Iron Bowl game! Eddie and I were at home together finishing up some cleaning and decorating when the game began at 2:30 p.m. As we watched the game, I decided we needed to do a little something different with the turkey and not just heat it up – blah! Boring! I remembered a Pampered Chef ham wreath recipe I had used many years ago. I looked it up online but couldn’t find the exact recipe so I used what I found as a basis and just made the rest up as I went along. 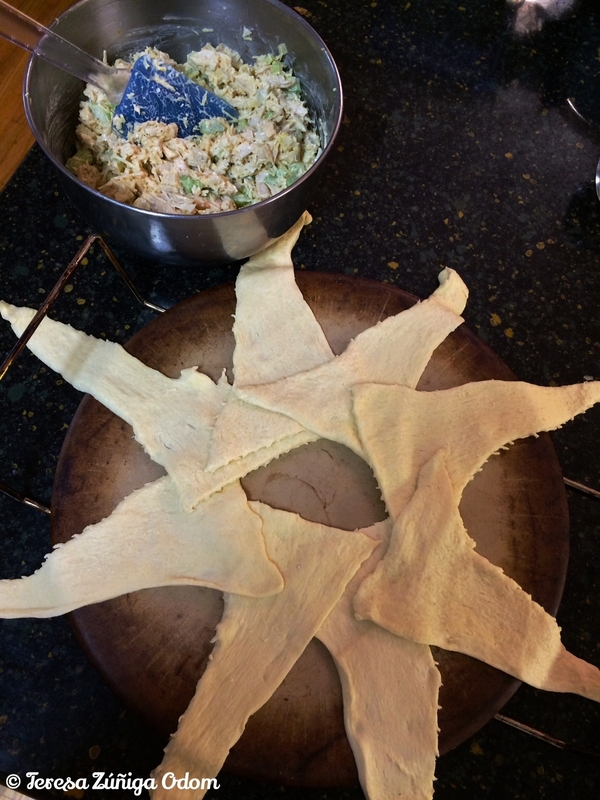 Next I took a can of Pillsbury crescent rolls (8 total) and arranged them in a star design – with the large part in the center on a cookie sheet. This is always a little tricky to me because they aren’t necessary the same size and when you see how it’s done in a photo…well, it’s perfect and that’s just ridiculous! I used to make the ham wreath every year at Christmas and it was NEVER perfect! After this was done – as perfectly as I could make it – I added the turkey filling by large spoonful. Finally, I wrapped the thin part over the mixture covering as much as possible. I cooked the wreath in a preheated over set at 350 degrees for 30 minutes. I would have liked to have added cranberries to give the wreath a little hint of sweetness, but my husband doesn’t like cranberries that much. I had leftover cranberry sauce from Thursday so I just added it next to my portion once the wreath was ready to devour. So good with a buttery chardonnay! Mission accomplished! 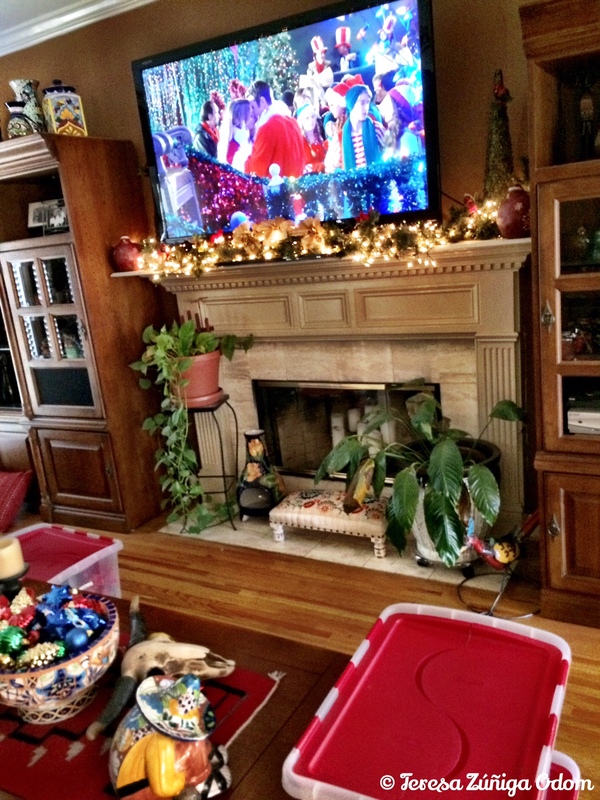 Big thumbs up from the husby…leftover makeover was a success! 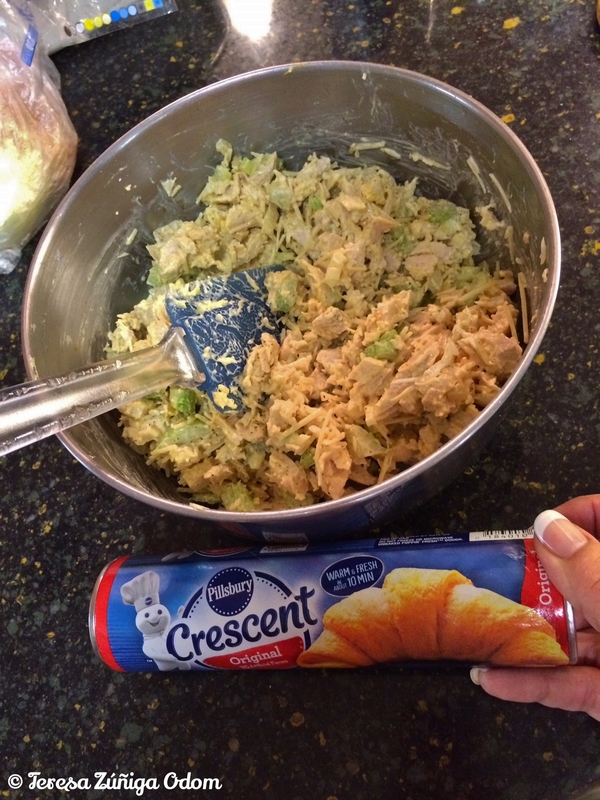 Arrange the ingredients by spoonful onto the crescent rolls. Fold the skinny ends of the crescent rolls over the mixture…I had to get a little creative with some of the longer ends. The finished product! After being baked at 375 degrees for 30 minutes. A close up of the finished product with a side of cranberries! 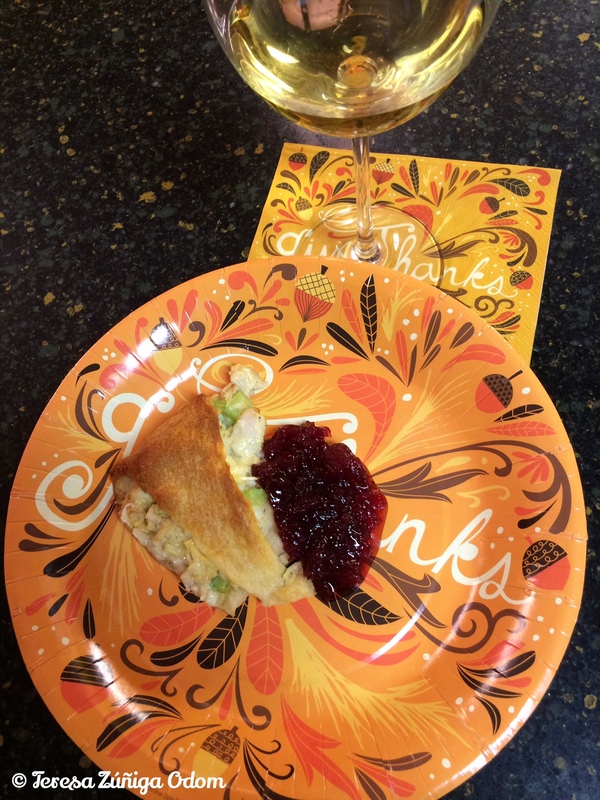 This entry was posted in Food, Holidays, Thanksgiving and tagged Bloglikecrazy, Dijon mustard, Foodie, Leftover makeover, Leftovers, Pampered Chef, Pillsbury crescent rolls, Recipe, Turkey wreath on November 29, 2015 by Southern Señora. Ornaments from my mother in their original boxes – I like to decorate with these each year by simply placing them in crystal/glass bowls. Yesterday I spent the entire day getting our house decorated for Christmas. At times it can be a little overwhelming with all the boxes and decorations all over the place. But I remind myself that this is my day to get it all together and the day is long! Plus, I have those sappy Hallmark movies to keep me going! O the Saturday after all this decorating takes place, I work on the finishing touches. Things like bows on lamps, centerpieces on the tables and hand towels in the kitchen and powder room. 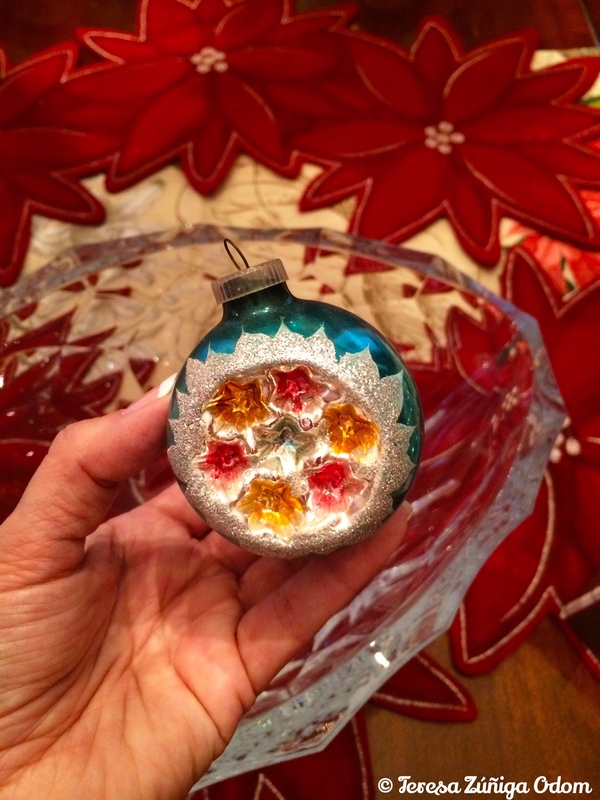 Another favorite things to do is to pull out all the ornaments from my mom that she collected from before I was born and simply put them on display in crystal bowls. This is one of my favorite of the old ornamets…beautiful detail! Decorating doesn’t have to be complicated and this is one of the things that makes me the happiest each year when I add the finishing touches. 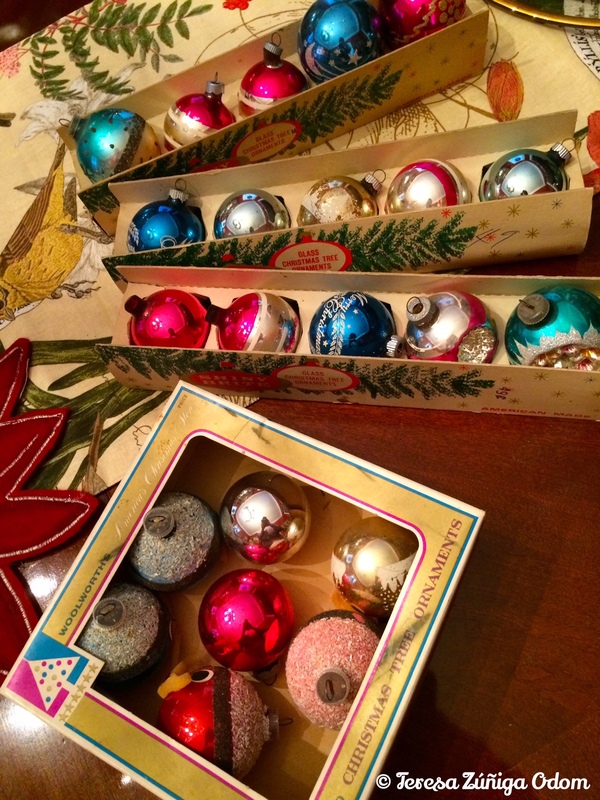 First of all, I love that the ornaments are still in the original boxes. You can still see the prices on the boxes. I have three boxes of “Shiny Brite” ornaments…mind you, not all the ornaments are original to these boxes but they are definitely old ornaments that we used to use when I was little. (Did I just say “old” in reference to myself?! Yikes!) These boxes have a 49 cent price tag on them. And who remembers Woolworth’s store? 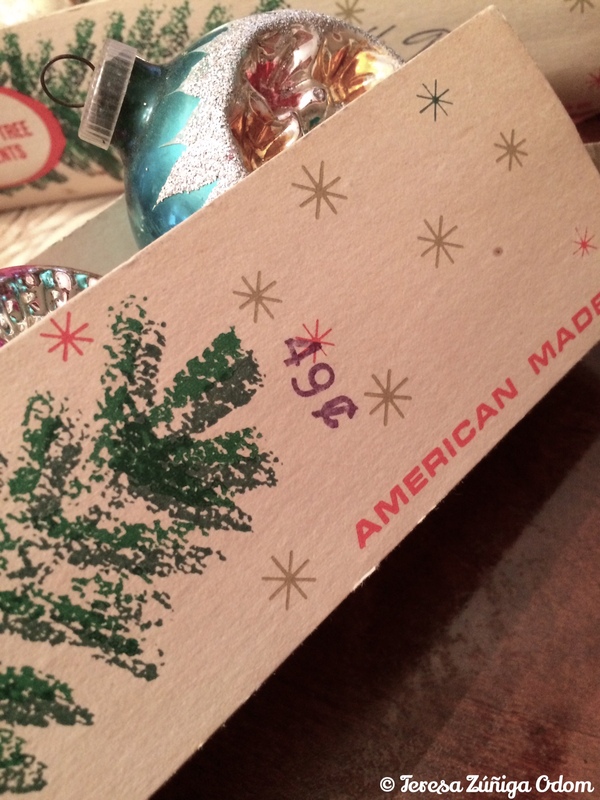 The box I have for a few more ornaments has a $1.49 price tag on it. 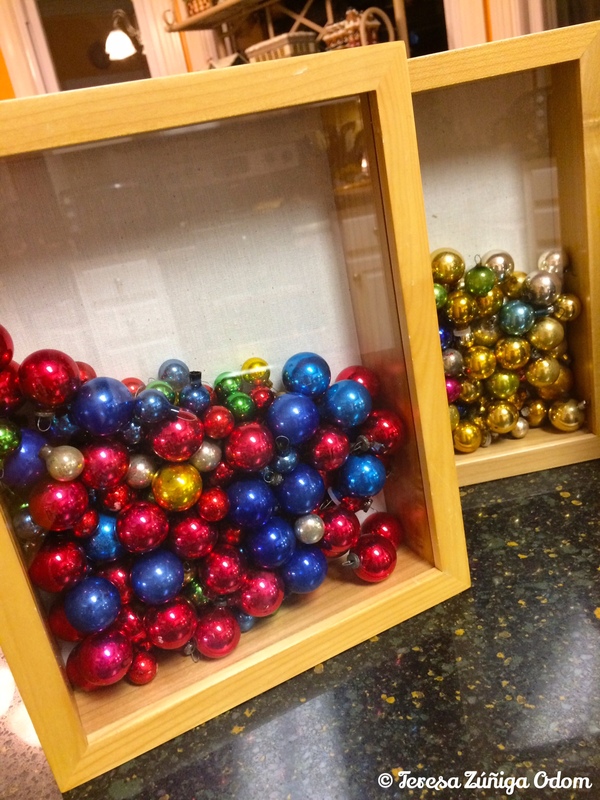 These are called “imported tree ornaments” – but I don’t see “where” they were imported. Regardless, it’s still nice to have this box. I love to put them all in a large crystal bowl and set them on my coffee table in my living room each year. I always tell my kids about the ornaments and of course, when they were little they used to roll their eyes a bit… Now, I think they are paying more attention to these things and why they are important to me and our family history. Shiny Brite ornament box with the 49 cent price tag stamped on the box. Small ornaments that my mother (first shadow box) used on her hutch each year and ornaments that my aunt and grandmother (second box) used in their Christmas decorating. 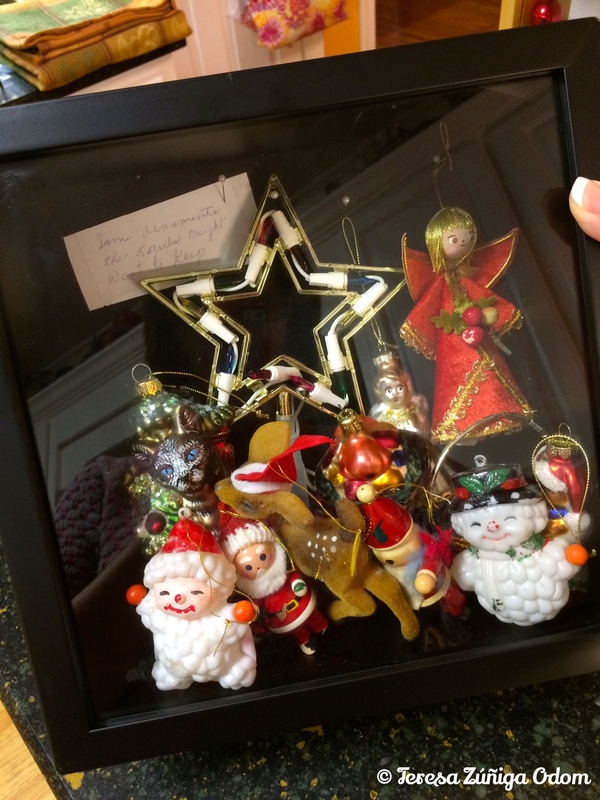 Finally, the one shadow box that makes me a bit nostalgic is the one I created with ornaments that were about to be thrown out after my mother-in-law (Johnnie Odom) passed away. All her sons were cleaning out her house and there was a box of ornaments that she had put aside with a handwritten note saying – “some ornaments the 5 girls might want to keep.” By this time, all the girls had gone through everything and picked out what they wanted. When my brother-in-law Allen showed me the box, I told him I would take them. I mean, there were several things I remembered vividly from her annual Christmas tree – the star she used at the top of the tree, the plastic snowman and Santa Claus, the felt reindeer…these aren’t expensive ornaments by any means. But they are priceless to me and now my children. It’s amazing how different things look when you preserve them in a special way…like in a shadow box. The Christmas after Johnnie passed, I displayed the shadow box and all the grandkids loved it. Plus, I added her handwritten note to the box. Their reaction made me feel like I had done something good for them and I love displaying it each year. Meanwhile…finished touches day is just about over…and tomorrow we decorate our family tree to round everything out. This entry was posted in Christmas, Decorating, Holidays, Odom Family, Zuniga Family and tagged Antique ornaments, Bloglikecrazy, Gail Stone Thomas, Johnnie Odom, Louise Stone, Nostalgia, shadow boxes, Shiny Brite, Woolworth's on November 28, 2015 by Southern Señora. 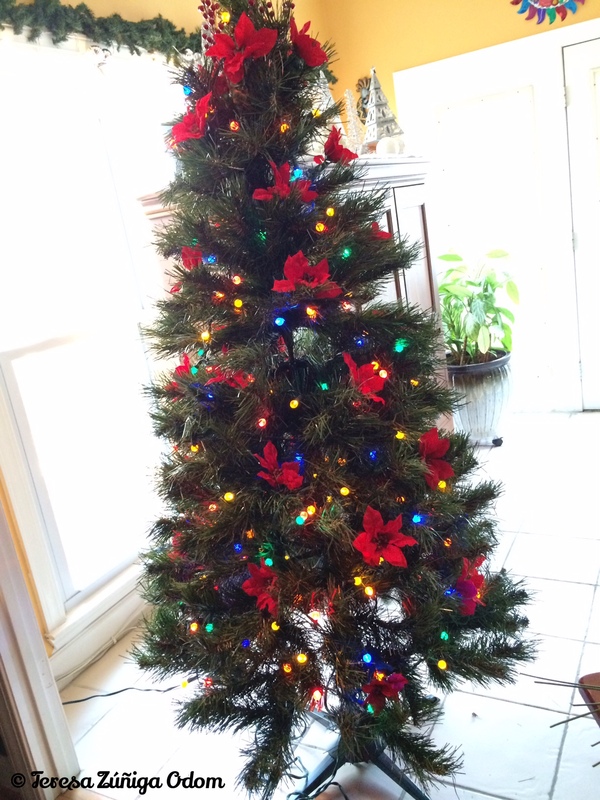 My Mexican Christmas tree…before I started adding ornaments this year! The day after Thanksgiving is my day to get the Odom home into the Christmas spirit! With Eddie’s help, we brought down all the boxes in the attic that I planned to use this year. I always start in the family room with the mantle. Luckily, Eddie was still hanging around and was able to help me with lights on the mantle greenery. The pre-lit garland decided it was done but I’m liking the strand of lights I replaced it with because the light seem brighter and there are more of them. After that, Eddie went off to work on his “to-do” list and I was left with Hallmark Christmas movies and the rest of the decorating. It’s become another tradition for me to watch all those sappy Hallmark Christmas movies as I’m decorating. Honestly…you can predict the outcome to every single one and yet I cry at the end of them all! It’s just like the those Hallmark commercials…they get me every time! The only thing I changed up a bit this year was my Mexican Christmas tree. I’ve bought quite a few new items this year and so I decided to retire a few older items. I added the grab bag ornaments I found thrifting recently. I also added all the tin ornaments I bought in Austin, Texas recently. 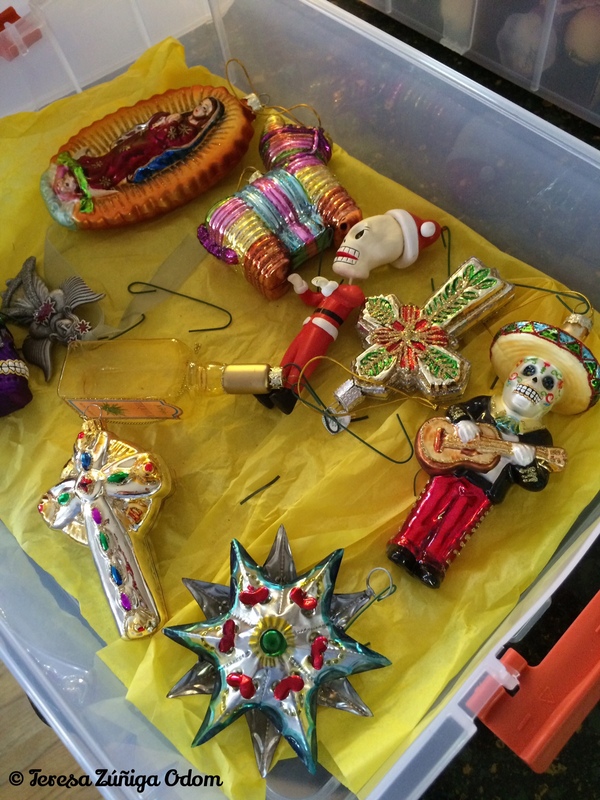 I bought a few sugar skull items at Sojourns in Birmingham a few weeks ago…they went on the tree too. 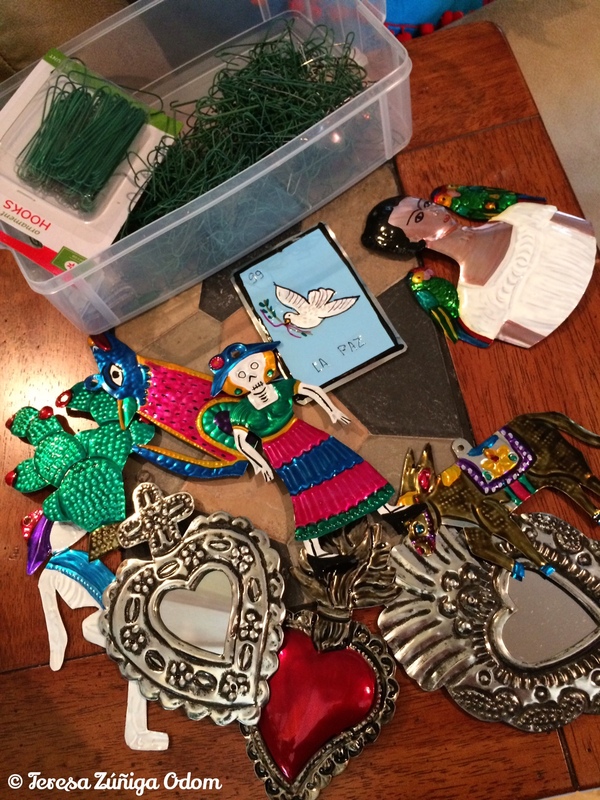 A few older items are a must every year, especially the crosses and my Virgen de Guadalupe ornament. 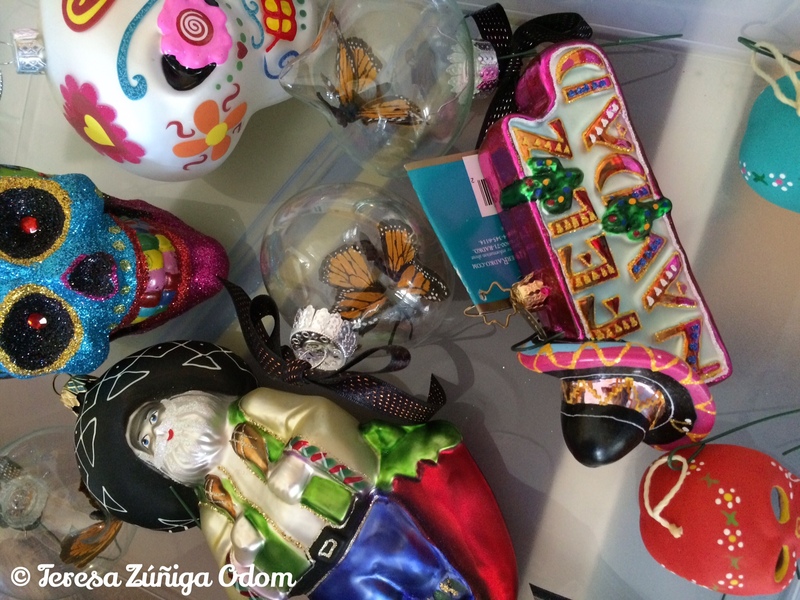 Mexican Santa ornament and my Christopher Radko -Feliz Navidad ornament (a gift from a friend) are always on the tree. It’s the one tree I generally decorate myself so I take my time and enjoy the process. This entry was posted in Christmas, Christmas Tree, Hallmark, Holidays, Mexican, Virgen de Guadalupe and tagged Birmingham, Bloglikecrazy, Christopher Radko, Decorating, Feliz Navidad, Hallmark Movies, Mexican Santa, Ornaments, Sojourns Fair Trade Store on November 27, 2015 by Southern Señora. 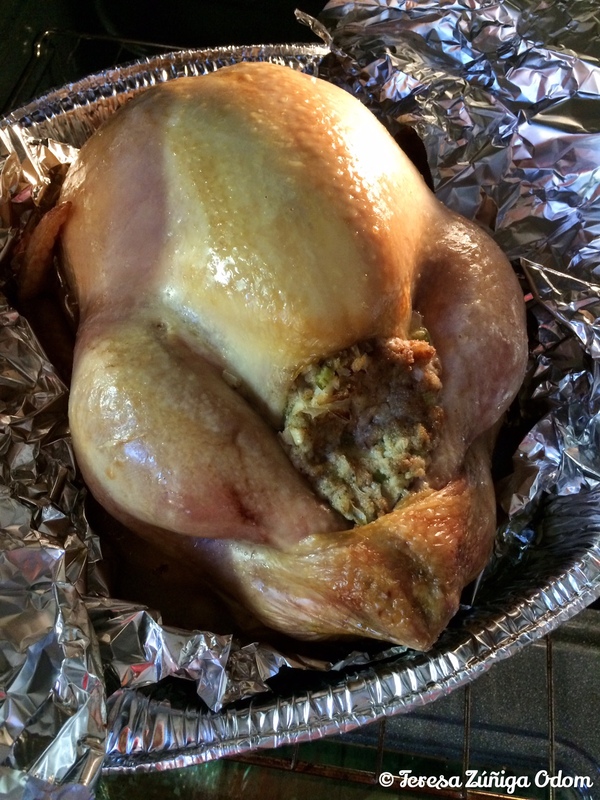 My first Thanksgiving turkey and stuffing – all by myself! 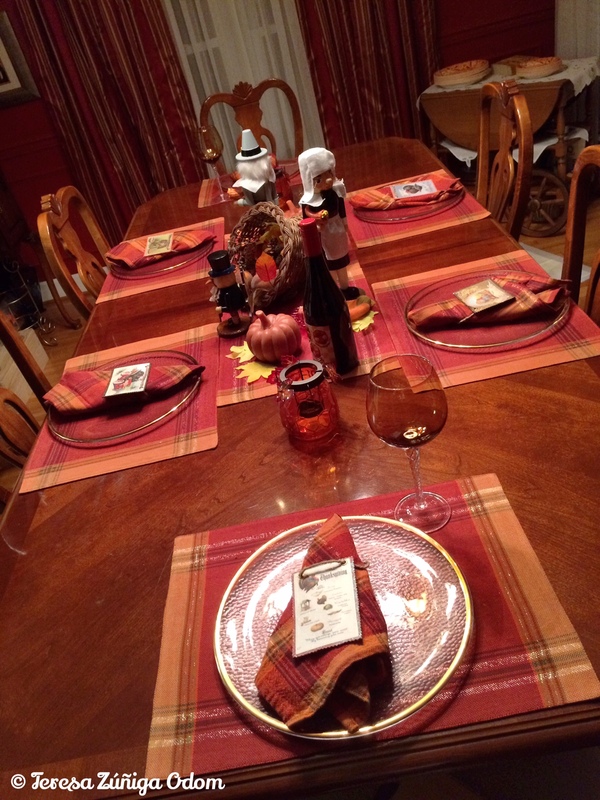 I have a confession to make…this is the first year that I’ve prepared an entire Thanksgiving meal by myself. Yep…that’s right! I’ve never in all my life done this…but this year I decided it was time. We had already celebrated Thanksgiving with the extended Odom family last Saturday. My brother-in-law, Terry, did the honors where the cooking was concerned. We brought the “big” cookie and some great wine. Before my sister-in-law passed away, she and my other sister-in-law typically did all the cooking. We had quite a banter going back and forth about the food. They would tease me because I didn’t cook and so I was always given the task of bringing the drinks and desserts. This usually consisted of pies from Costco. (FYI – This was before the big cookie made it’s appearance in recent years.) I joked that my culinary expertise was so great that I had sold my pie recipe to Costco so why should I make them when I could buy them! In reality, I told them one year not too long ago, that it didn’t make sense for me to cook since they were both so good at it! It was the truth too, not just a line to get out of doing the work. Their Thanksgiving menu was always fabulous! Over the past few years, I’ve wanted to learn more about how to make our Zuniga traditional Thanksgiving meal – in particular the turkey and stuffing – so I asked my mother to teach me and my daughters what to do. I took pictures of the process and also wrote the directions down – which I can’t seem to find now. She loved doing this with us and we a blast learning her method of cooking. Anyway, my mother went to Chicago this year to be with my sister and her family and since Eddie and I were going to be home with two of our three kids this Thanksgiving, we decided to get a turkey and make a traditional meal. Rather, he bought the turkey and “I” made the traditional meal! 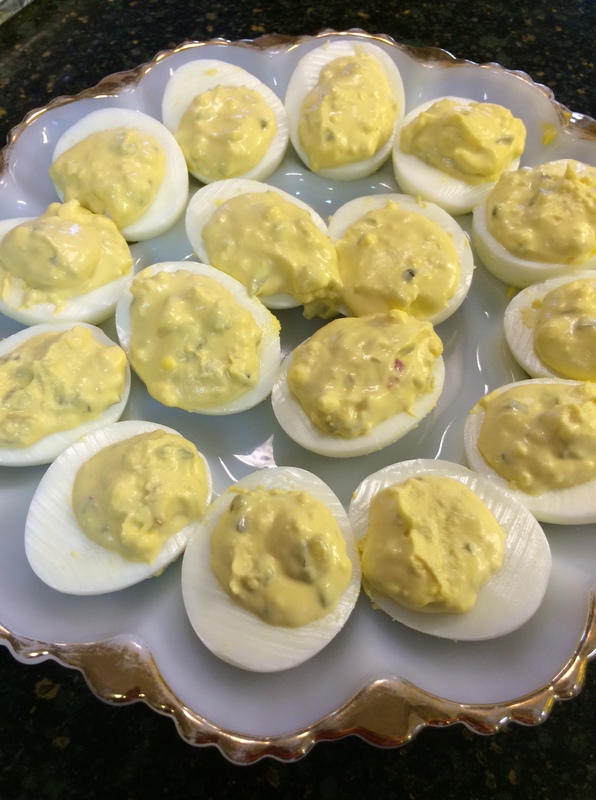 Deviled eggs…a little mayo, mustard and sweet pickle relish. Delish! I made the stuffing (or dressing) and stuffed the bird close to midnight last night. I had enough for a casserole dish of dressing on the side. I also made deviled eggs because these are a staple at every Thanksgiving meal! The heavenly aroma of turkey woke me up early and my husband nudged me out of bed so I could check on the bird and turn the oven off. We got up to make breakfast for the family – my daughter Anna Marie and her new hubby Ryan came by for French toast before heading out-of-town this afternoon. 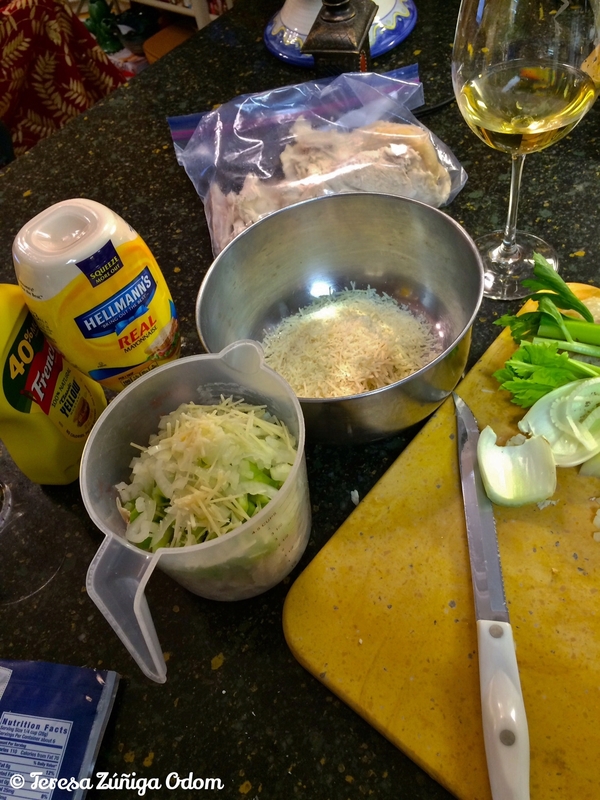 While they were here, I made the other preparations… peeled potatoes, got the mac and cheese ready, green beans and almonds in a pan and finally, took a shot at making giblet gravy. It was a little thick (I think I used too much flour), but it did the trick and everyone seemed to enjoy it on their food. Enough food for an army! My brother-in-law and sister-law, Allen and Rhonda came over to join us for our Thanksgiving meal. It was a small group but it was really nice and relaxing once we got our plates fixed and sat at the dining room table to eat, talk, laugh and share stories. Pumpkin pie and apple/cranberry pie were the dessert choices. I’ll have one of each please with a little whipped cream! It was a great day and I’m tired now but it’s a good tired. I feel great about being able to make this wonderful meal for my family and we have plenty of leftovers for tomorrow and the weekend! Happy Thanksgiving y’all! I hope you and your family had a wonderful day together too! This entry was posted in Cooking, Food, Holidays, Odom Family, Thanksgiving, Zuniga Family and tagged Bloglikecrazy, Dressing, French Toast, Happy Thanksgiving, Mimosas, Stuffing, Turkey, Zuniga Family, Zuniga Family Reunion on November 26, 2015 by Southern Señora. Tonight I’m looking at my Thanksgiving table and anticipating tomorrow when we will gather together and enjoy a wonderful meal and each other’s company. This year will be a little different. We’ve already had our “big” Thanksgiving family gathering in Jasper – this past Saturday. Tomorrow, it will be me, Eddie and two of our children. We’ll add my brother and sister-in-law too. Hopefully a few of the nephews will be able to join us at some point. It will be a small gathering, but it will be family and I’m so thankful we have one another. My “married” daughter – Anna Marie – and her new hubby, Ryan, will join us for a Thanksgiving breakfast tomorrow morning, which is something new to us. We’ll be having French toast! So maybe this will be a new tradition? I don’t know but whatever the case, I’m just thankful they are able to spend a little time with us tomorrow. 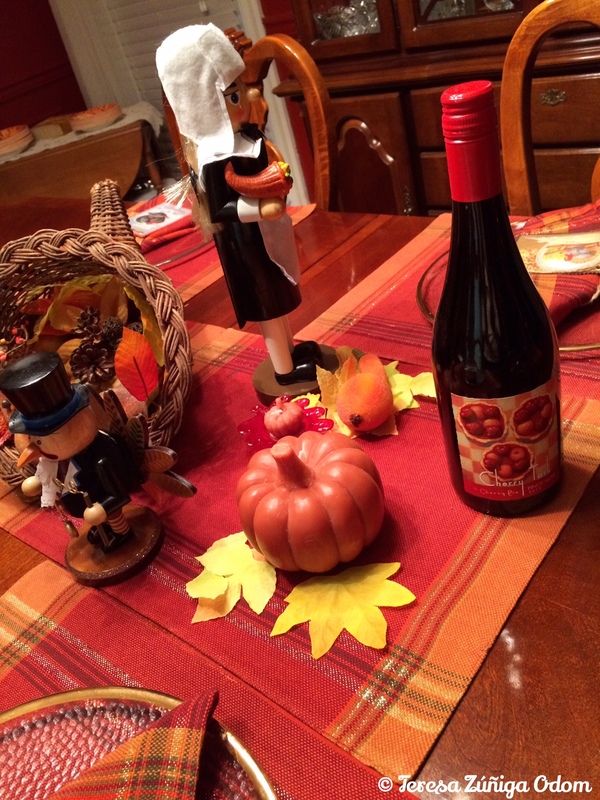 A portion of my Thanksgiving table centerpiece…I found a new wine to try tomorrow too – Cherry Tart Pinot Noir! In the end, we will be together as a family – whoever can be here – and we’ll enjoy the time together. We’ll add people to the table along with the food and it will be wonderful. I hope you and yours have a wonderful Thanksgiving tomorrow! Enjoy your time together…and blessing to all. 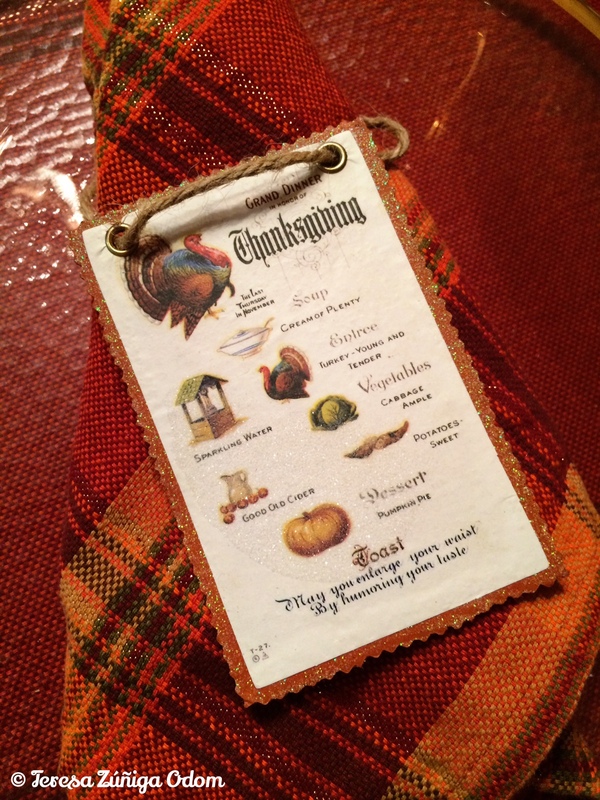 Found these old timey cards at World Market a few years ago and have been using them as napkin rings…they add a certain something to the table, don’t you think? 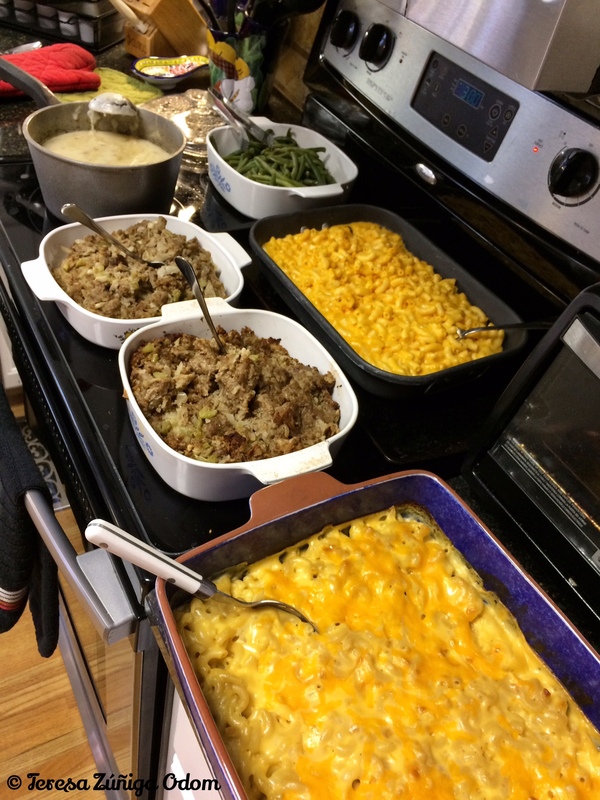 This entry was posted in Familia, Odom Family, Thanksgiving, Zuniga Family and tagged Bloglikecrazy, Deviled Eggs, Thanksgiving prep, Thanksgiving Table, Turkey on November 25, 2015 by Southern Señora. Salsa Senorita’s Easy Cheese Dip! The HICA tamale sale is just two days away! Thanksgiving day!!! The tamale sale is HICA’s signature event and you don’t want to miss out. Go to http://www.hispanicinterest.org to order your tamales. You have until December 11th and pick up day is at the HICA offices on December 18th. As I mentioned in a previous post, we partnered with Lori Sours of Salsa Senorita to produce 4 videos using her salsa and recipes and our tamales! Lori will have her salsa on sale during pick up day too if you want to pick up a jar or two (or three!) that day. A portion of the proceeds will benefit HICA. Here is the latest video in partnership with Salsa Senorita and produced by Jessica Chriesman. This one features an easy cheese dip you can pour over the tamales and enjoy. Featured in the video is Maricela Garcia, a HICA board member. Mari was recently honored by the Alabama Media Group as one of 34 women who shape the state! Meanwhile…enjoy the video and hope to see you on tamale pick up day if you are in the Birmingham area! This entry was posted in Cooking, HICA, Mexican, Salsa, Tamales and tagged Alabama media Group, Bloglikecrazy, Cheese Dip, Foodie, HICA, HICA Board Member, Jessica Chriesman, Lori Sours, Maricela Garcia, Salsa, Tamales, You Tube Video on November 24, 2015 by Southern Señora.